Whether your bench power tools are well-worn from daily use or spend most of their time in storage, you understand the importance of caring for them properly to keep them in top working order. Nothing helps you do that more effectively than Boeshield T-9®—the only product you need to clean, lubricate and protect metal tools of all kinds, even those stored in a damp basement or unheated shed. 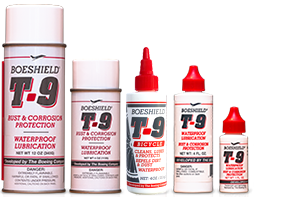 Use T-9 to protect against rust and corrosion, with no need to dismantle your equipment. T-9 stays liquid long enough to reach deep into the smallest areas of power tool table tops, permeating metal pores, displacing moisture, then drying to a thin, waterproof film that protects for months. The unique formula of solvents and waxes contains no silicone or Teflon, so T-9 will not pick up on wood surfaces or interfere with subsequent finishing. Protect working machinery. Spray T-9 on and wipe off. Repeat approximately once per week. Protect in storage or severe environments. Spray T-9 on and allow to dry. Repeat every 6 to 12 months. Re-spray and wipe off when ready for use. Reaches deeper. T-9 stays liquid long enough to permeate metal pores and seep deep inside the smallest areas to leave a durable protective coating—all without dismantling your equipment.